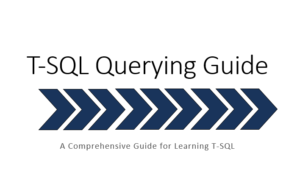 The Knowlton Group offers customized T-SQL training for organizations looking to build the necessary database querying skills for their employees. With the growing emphasis on business intelligence and analytics, understanding the foundation of querying a database is essential before using advanced business intelligence and reporting tools such as Qlikview or Tableau. Training will be tailored to the goals of your organization and the experience level of the students participating in the training. Practice problems will be designed to allow your employees to immediately solve business problems with the use of their newly developed skills. Anyone who is looking to learn how to query a database and provide actionable intelligence from the enormous amount of data organizations now possess and generate. Business power users, IT/IS support staff, business intelligence developers, and even VPs can benefit from the knowledge gained from this training. With data becoming more important in effective decision making, understanding how to retrieve data and return results in the format required is a necessary skill to possess. How many people can participate in training? Groups should number less than fifteen people to provide the greatest amount of interaction and allow proper dialogue. For those organizations looking to train more than fifteen people, it would be worth discussing breaking the training into two separate groups. “I have had the opportunity to work closely with Brewster Knowlton over the past 2 years. Brewster has been working at our facility as a contract technical resource. More specifically, Brewster has provided our facility with high quality SQL Server expertise. Brewster’s technical expertise, enthusiasm, professional demeanor and strong work ethic are to be commended. Recently, Brewster provided an excellent, week long SQL Server training session to staff members from several different departments within our organization. All attendees to this training were very impressed at the comprehensive and well organized approach Brewster took when he provided the course content. Training will be customized to fit the needs of your organization. The standard practice is to complete five sessions of at least four hours per day. Companies seeking to provide a more basic level of knowledge to their staff would be more apt to the five day, four hour per day schedule. Companies seeking to have their staff possess a more intermediate to advanced level training would be best served by a five day, eight hour training. Standard training topics can be seen below. However, training can be modified based on the needs of the group. If you are interested in getting more information about SQL training opportunities with The Knowlton Group, contact brewster@knowlton-group.com.